میدان پارلمان (انگلیسی: Parliament Square) یک میدان مهم در شمال شرقی کاخ وست‌مینستر در شهر لندن است. این میدان که از جاذبه‌های گردشگری لندن می‌باشد، ساختمان‌های مختلفی همچون کاخ وست‌مینستر (شرق)، دیوان عالی بریتانیا (غرب)، کلیسای وست‌مینستر (جنوب) در اطراف آن قرار دارد. Epstein جیکوب اپستین ۰۷ ۷ نوامبر ۱۹۵۶ Winston Churchill, on his return to power in 1951, wished to erect a statue to Smuts; he was, however, unable to perform the unveiling due to illness. The pedestal is of granite from South Africa. A replica of the statue in پارک لینکلن، شیکاگو. This statue was unveiled by Prince Arthur, Duke of Connaught, after being ceremonially presented by the American ambassador and accepted by Prime Minister دیوید لوید جرج. Initially the statue was to be erected in 1914, but this was postponed. By that time some favoured an alternative statue by George Grey Barnard, which was eventually erected in Manchester. Westminster Council had earlier refused permission for placing the statue in Trafalgar Square adjacent to South Africa House. The statue was unveiled by Prime Minister گوردون براون in the presence of Wendy Woods, the widow of Donald Woods, a late anti-apartheid campaigner, and the British actor, director and long-time friend of Woods, ریچارد اتنبرا. تندیس ماهاتما گاندی، رهبر جنبش استقلال‌طلبی هند بر اساس عکسی به سال ۱۹۳۱ از او در بیرون از دفتر رمزی مک‌دونالد، نخست‌وزیر بریتانیا ترسیم شده است. هند Finance Minister Arun Jaitley on 14 March, 2015. The statue was dedicated as a commemoration of the centennial of Gandhi's return to India from آفریقای جنوبی، which is generally regarded as the commencement of his efforts for Indian independence. Speakers at the unveiling of the statue included نخست‌وزیر بریتانیا دیوید کامرون، Indian film star آمیتاب باچان and Gandhi's grandson Gopalkrishna Gandhi. تندیس مهاتما گاندی، اولین مجسمه یک فرد هندی و تنها فرد بدون مقام سیاسی رسمی است که در میدان پارلمان نصب شده‌است. ↑ Howard, Philip (2 November 1973). "Resolute and defiant as ever, Churchill's statue is revealed". The Times. ↑ "Winston Churchill's statue 'had a look of Mussolini'". The Daily Telegraph. 1 January 2004. Retrieved 23 September 2011. ↑ "Noble, Matthew (bap. 1817, d. 1876), sculptor". Your Archives. The National Archives. Retrieved 23 October 2011. ↑ "The statue of Abraham Lincoln in Parliament Square". Your Archives. The National Archives. Retrieved 7 October 2011. ↑ "London Mandela statue for Parliament Sq". BBC News. 29 August 2007. Retrieved 30 September 2011. مشارکت‌کنندگان ویکی‌پدیا. 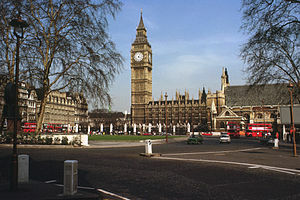 «Parliament Square». در دانشنامهٔ ویکی‌پدیای انگلیسی، بازبینی‌شده در ۱۱ مه ۲۰۱۶. در ویکی‌انبار پرونده‌هایی دربارهٔ میدان پارلمان موجود است. این صفحه آخرین‌بار در ‏۲۰ اوت ۲۰۱۸ ساعت ‏۱۳:۳۷ ویرایش شده‌است.